The offensive line has been the #1 priority in the 2019 class as new offensive line coach Ed Warinner has been looking to make big changes. 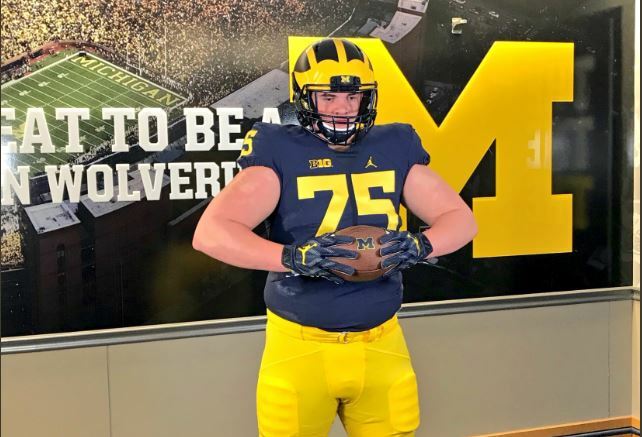 With four linemen already on the board, the Wolverines welcomed another mauler to the list as Moeller (OH) OL Zach Carpenter has committed to Michigan. Carpenter was a wanted recruit for a reason. He’s an absolute mauler that uses his strength and technique to dominate a high level of competition in Ohio. He’s projected to play offensive guard but also looks to be the type of lineman that could slide to center, if necessary. Where ever he ends up, thanks to his physical talents and experience against better talent, he’s a player that could play early in his career. Early on in Carpenter’s recruitment, he didn’t have a ton of attention and looked to be a recruit that staff’s were waiting on to offer. He even camped at Michigan back in the summer of 2017 but didn’t receive his offer from the staff until April 2018. That was received during an unofficial visit to Ann Arbor. He immediately made a return visit to town the following weekend which quickly prompted Crystal Ball predictions for the offensive guard to the Wolverines. Mine included. But it wasn’t just Michigan that was going after Carpenter. The three-star prospect landed offers from Nebraska, Clemson and Michigan State following his visit to Ann Arbor. And all the momentum looked to jump to the Tigers, enough so that myself and everyone else, mistakenly, flipped their Crystal Balls to Clemson. But before ever visiting Death Valley, Carpenter surprisingly committed to Michigan on Wednesday night. He becomes the fifth offensive line commitment in the class and another beast of a lineman for Ed Warinner to work with. Carpenter is the 11th overall commitment, the fifth offensive line commitment, and the third commitment out of Ohio. But even with five already on board, he probably won’t be the last lineman. Michigan is still in very good shape with both OL William Harrod and OT Trevor Keegan. It’ll be interesting to see how the staff pursues both moving forward. Tackle would look to be the bigger position of need and Keegan looks to fit that bill most. However, Harrod is a near lock to choose Michigan. Could they take both? There’s plenty of time to go until National Signing Day, anything could happen between now and then.